This is the newest compliant technology on the market. 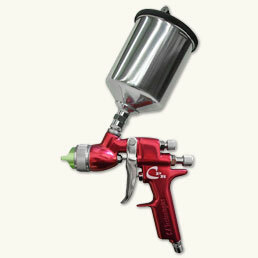 The CPR spray guns from C.A.T. combine the transfer efficiency of HVLP with the speed and finish quality of conventional air spray. The nozzle requires 11cfm at 29 psi recommended inlet pressure. The CPR guns are available in two types of packs, one for the automotive industry, and one for the wood industry. These kits will also be available with your standard 1qt. aluminum gravity cup or the popular 3M PPS. Both gravity versions include the new CPR air cap and the HVLP air cap, along with three different needle and nozzle sizes, multi-purpose wrench, nozzle wrench, cleaning brush and mini regulator.